These durable and generously proportioned sacks are great to have on-hand when you're taking care of DIY tasks around the home. This pack contains ten bags, each of which has a capacity of 45 litres and measures 66cm in length and 112cm around the rim. 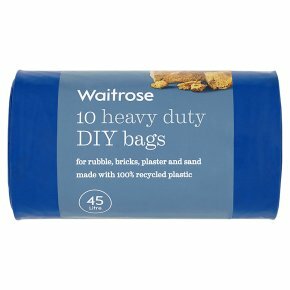 These bags are suitable for carrying everything from rubble to sand and bricks to plaster, and since they're part of the essential Waitrose range they offer value as well as quality.